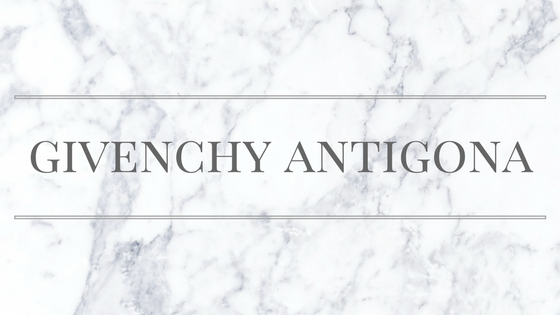 Welcome my new everyday handbag - Givenchy Antigona in size Medium. Recently, I have been looking for an everyday bag to replace my Micheal Kors but, I have not been able to find that perfect one until I came across this one! In all honesty, I did not expect to make this purchase, if I was going to purchase an Antigona, it was always going to be a mini or small as I like my luxury purchases to be for occasions and not for everyday use. This is because I am always worried about ruining them and scratching them! I don't have the money to replace any so I am always ever so careful and baby my bags like no other! I realised though all my bags are just sat in the wardrobe waiting to be used, so now this bag is my everyday bag and, if I do get a scratch - then I do! We only live once! So now for the bag, I brought this in Bicester for £1167 instead of £1800+? so a massive saving! It has small studs around the outer edge of the bag and is in non-shiny calf leather. It is a limited edition piece and I was very lucky to get hold of it in Bicester as normally they have bright colours and nothing which suits me or draws my attention. The dimensions of the bag - 13.4 X 11.4 X 7.5 inches. The bag came with a dustbag and a care card. There is only the main zip on the bag and a small compartment inside. I like the fact it has a zip as before I was also looking at the Saint Laurent Sac de Jour however, it has no zip which makes me scared in case my bag tipped over or someone put their hand in and grabbed my purse. This bag also has a thick strap which can I just say..is amazing! It makes carrying my laptop a lot easier and less painful! The strap is only short but it is very comfortable. What can I fit inside it? I would definitely recommend this bag as an everyday bag if anyone is looking specifically for a luxury bag. The only thing is it does scratch easily. Luckily I haven't scratched it yet but the lady at the store did say it can very easily scratch.